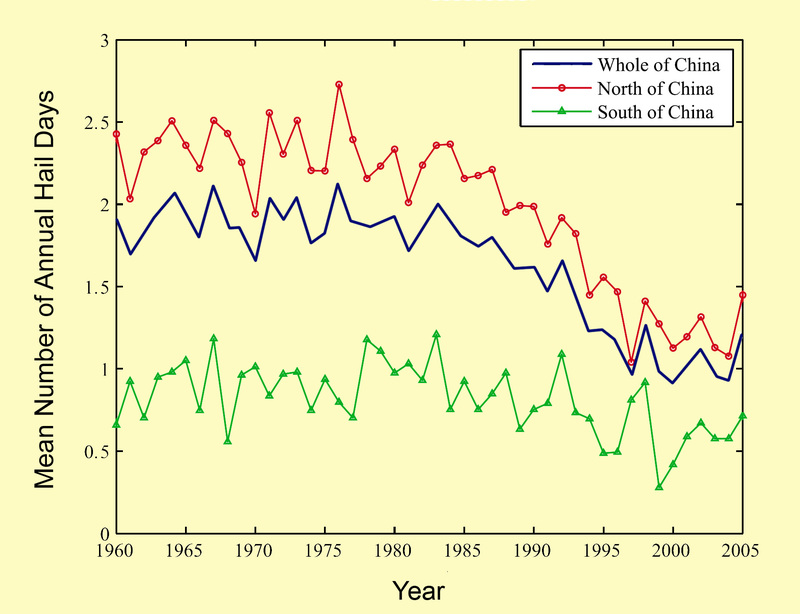 From an historical hail dataset of 753 stations compiled by the National Meteorological Information Center of China, which "includes hail data for all weather stations in the surface meteorological observational network over the whole of China from 1951 to 2005," the authors "chose 523 stations with complete observations from 1960 to 2005" to use in their study of "annual variations and trend[s] of hail frequency across mainland China during 1960-2005." 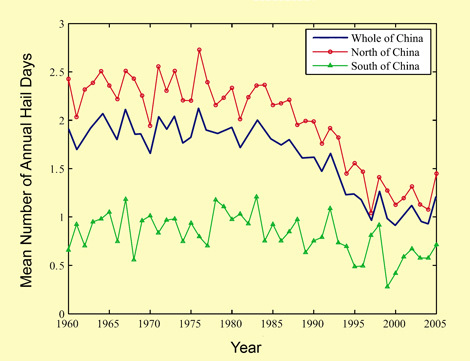 As is clearly evident in the following figure, Xie et al. report that the results of their study "show no trend in the mean Annual Hail Days (AHD) from 1960 to [the] early 1980s but a significant decreasing trend afterwards," which latter downturn, we might add, was concomitant with a warming of the globe that the world's climate alarmists claim was unprecedented over the past one to two millennia. Although climate alarmists continue to claim the world will experience more extreme weather as the planet warms, this study clearly suggests -- as the three researchers who conducted it conclude -- that, in China, global warming may actually imply "a possible reduction of hail occurrence."